If you are considering improvements to your facility in any of these areas, or would like to get more information, feel free to contact an expert at ESD today for assistance with customized golf pad solutions for your operations. Golf course Superintendents worked with ESD on developing what we now call a turf-care facility “Environmental Center”. Pictured is an Environmental Center at an 18-hole golf course in the Midwest United States. 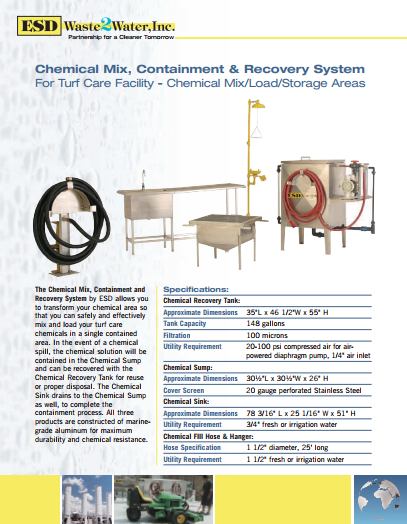 It includes a closed-loop mower and golf cart wash rack, a contained chemical mix/load/storage area with chemical recovery, and a contained fuel area. This Environmental Center was designed and installed by ESD. Construction was performed by local contractors. Pictured is a 2-Hose ESD wash water recycle system located on an 18-hole golf course in the Midwestern U.S. 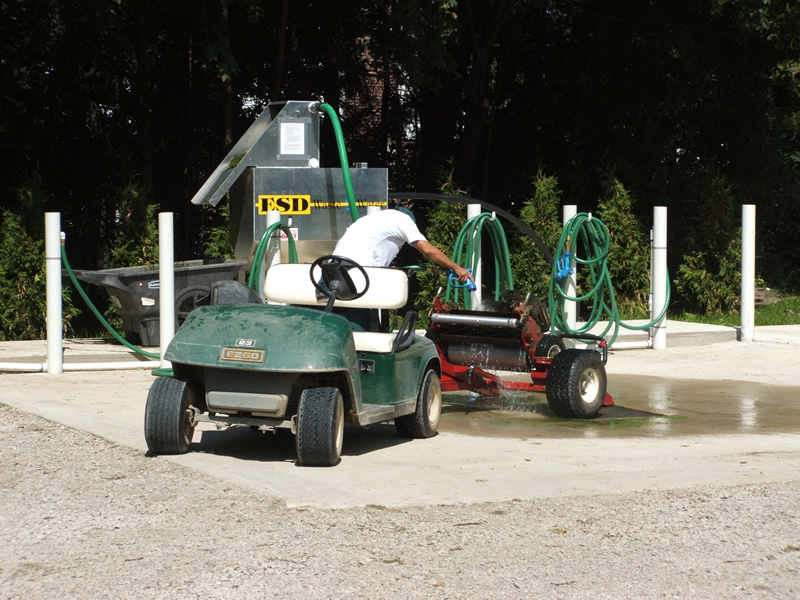 The wash bay was designed and installed as part of a new mower, cart wash and maintenance facility for this golf course. Pictured is a chemical mix, load, storage and chemical recovery area as designed and installed by ESD Waste2Water for Golf Courses. The chemical building includes chemical placards, over 400 gallons of chemical spill containment, and non-porous metal shelving. The chemical mixing area includes 380 gallons of chemical spill containment along with the ability to recover and reuse spilt chemical. The area also includes an emergency eye wash/shower. 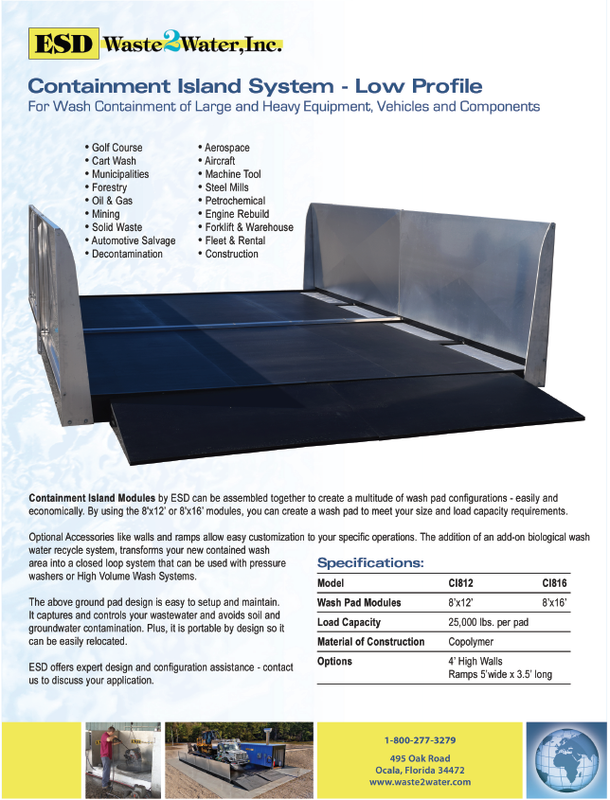 In cases where a temporary wash rack is needed, or if permitting is difficult, the ESD portable wash system is the perfect solution. 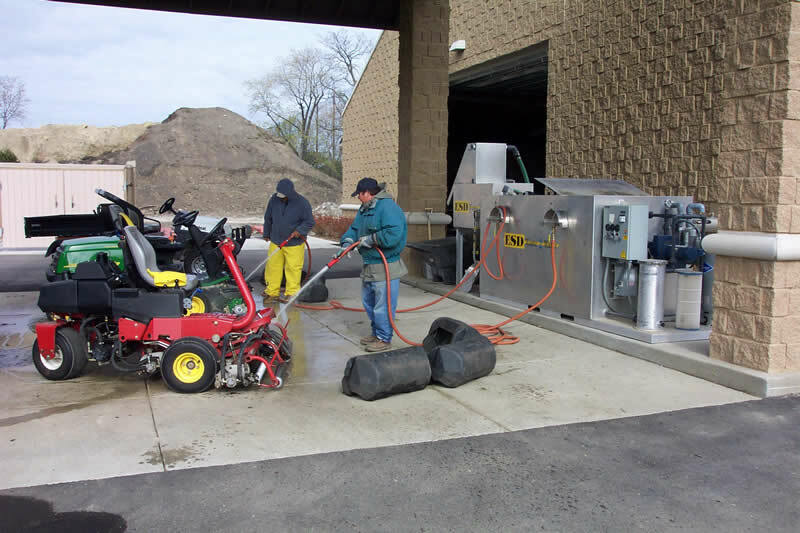 Pictured is a 2-hose wash water recycle system integrated with a 16’ x 24’ portable wash pad located at a turf-care facility. They are using our wash rack as a golf cart washing station. 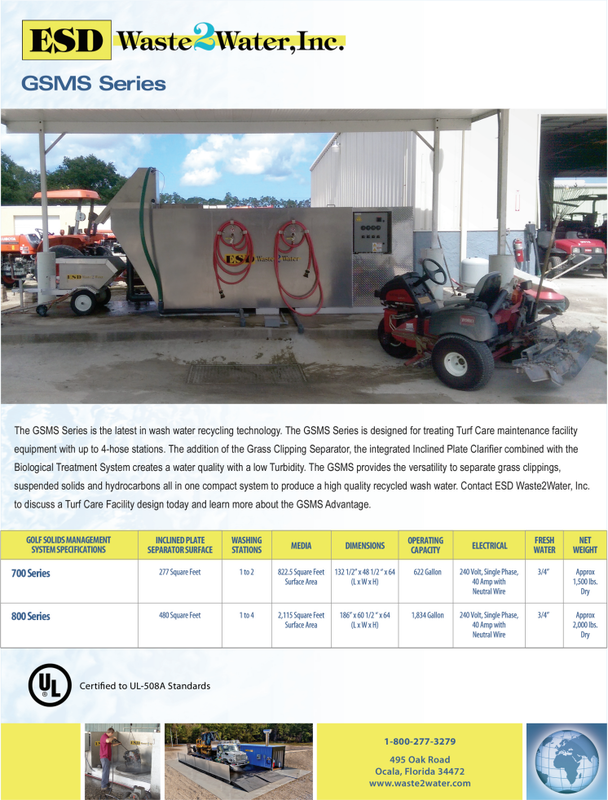 Pictured is a 4-hose wash water recycle system for a 36-hole golf course located in the Southeastern United States. Four pieces of equipment can be washed simultaneously with this wash rack, as designed and installed by ESD Waste2Water. 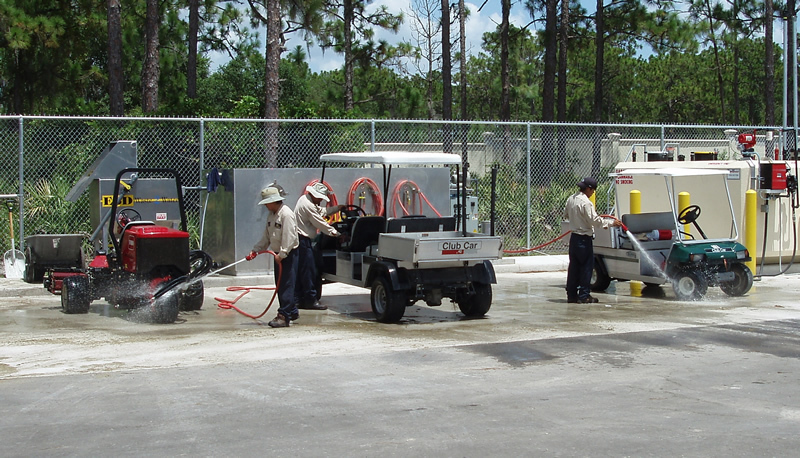 As you can see, our products work well for mower, UTV, and golf cart washing. 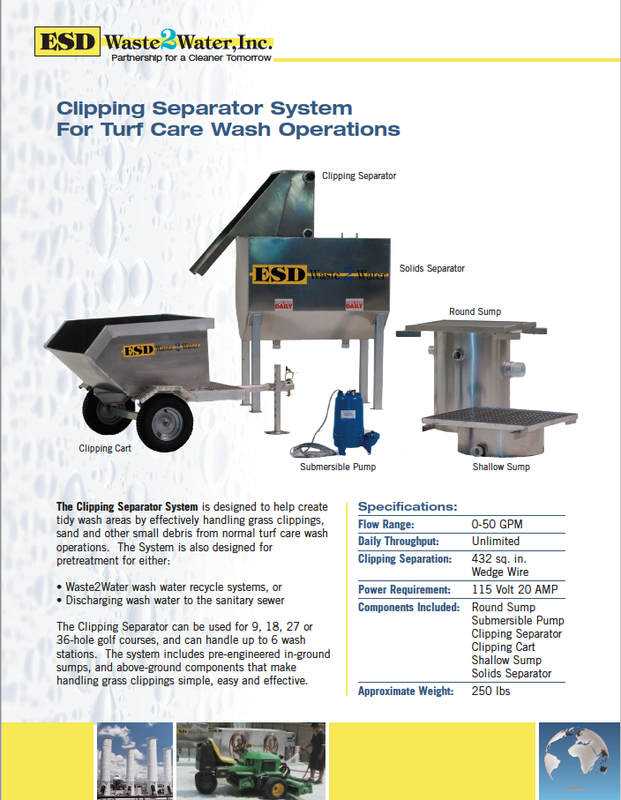 When a closed-loop wash system is not required, ESD can provide an efficient clipping separation system for removing grass clippings from equipment wash water to facilitate easy handling and disposal of the clippings. 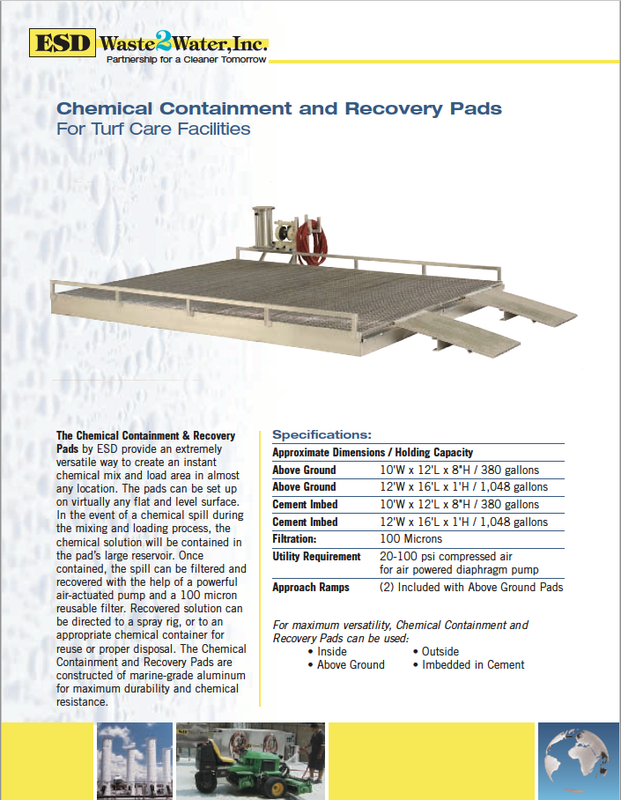 A complimentary evaluation of your site for wash rack, chemical handling or fuel operation requirements. 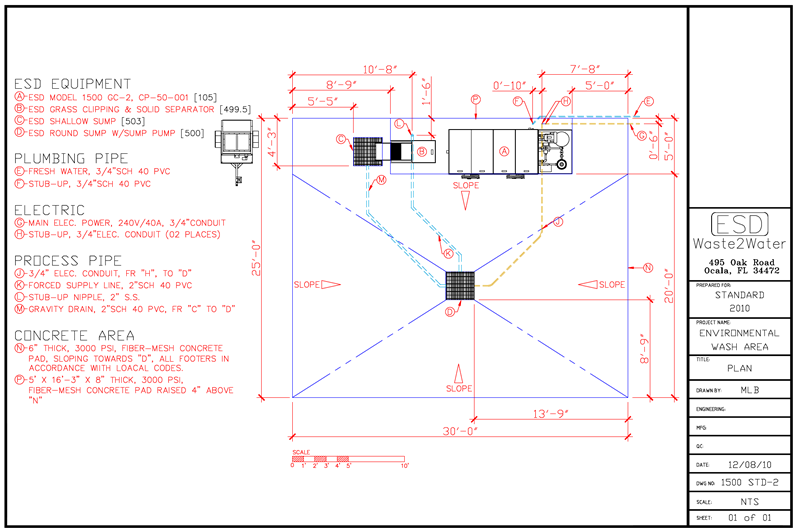 Complementary custom design of your wash rack, chemical area or fuel area. Manufacture of equipment to meet your requirements. Installation of ESD equipment and onsite O&M training. 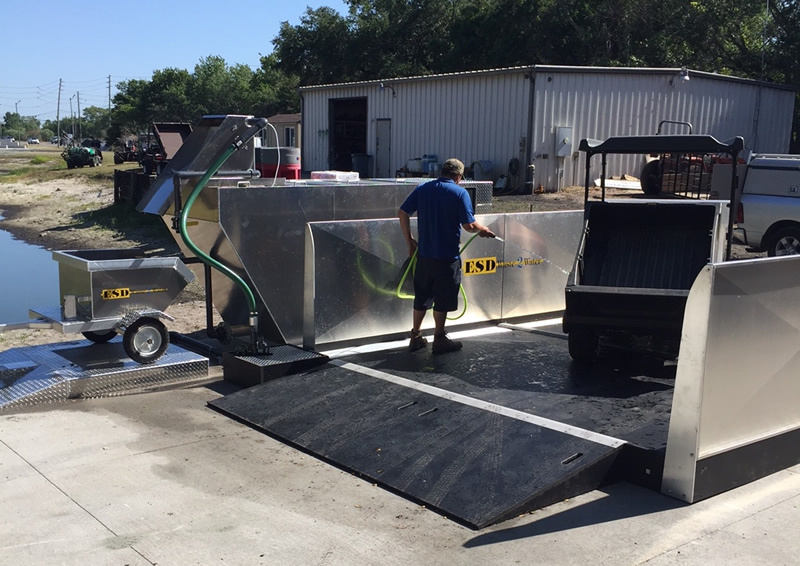 ESD Waste2Water, Inc. manufactures a full array of Wash Water Treatment and Chemical Mix/Load Equipment to meet the Golf Industry best practices. 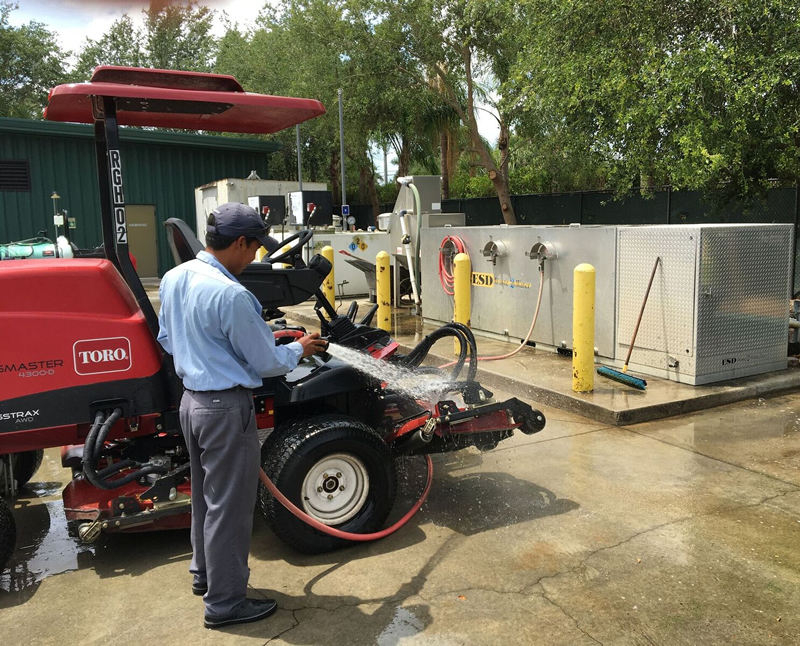 Our Biological Wash Water Treatment System treats the waste water generated from washing off fairway mowers, green mowers, utility equipment, etc. 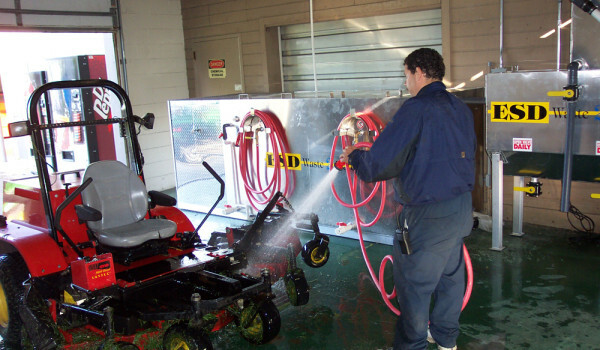 The High Flow adjustable nozzles allow the operators to get into the tough to reach undercarriage and mower decks to properly clean the debris. 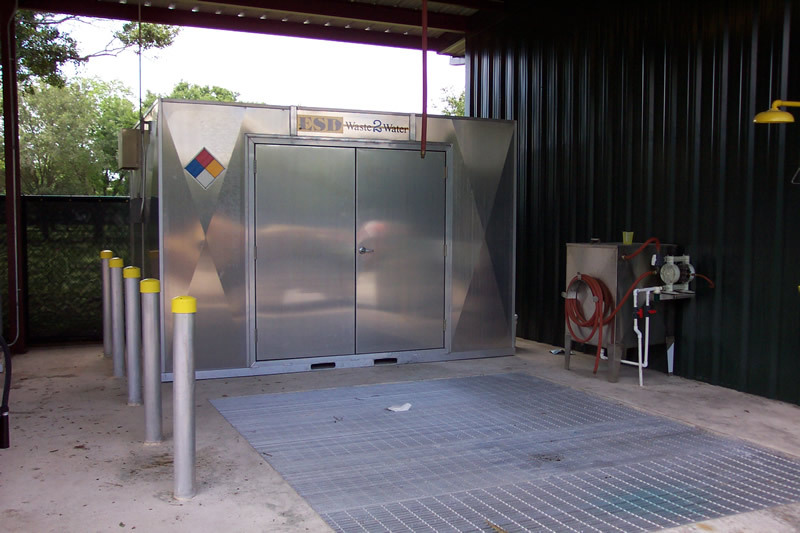 The water and debris can then flow into a specially designed In-Ground Sump Pit with a sump pump that lifts above ground through an ESD Waste2Water, Inc. Grass Clipping Separator System. The heavy debris (grass clippings, leaves, etc.) 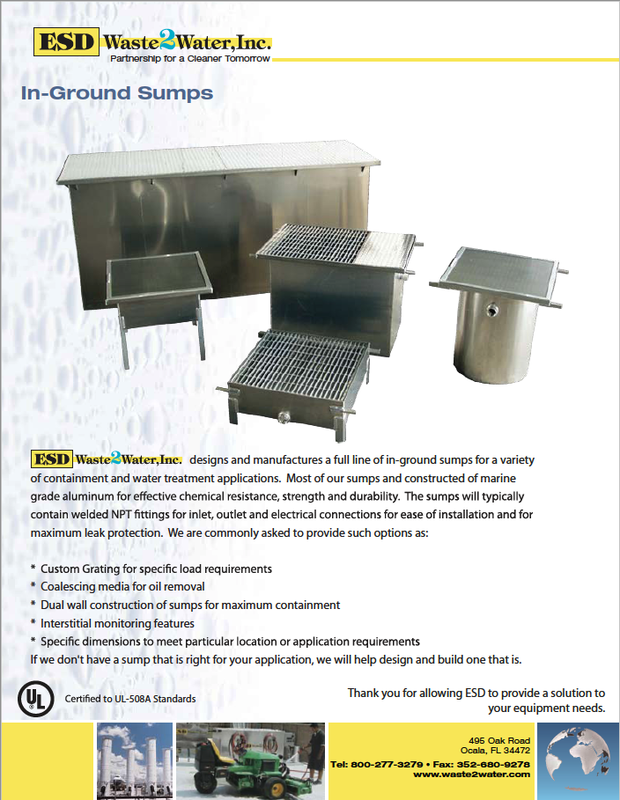 are filtered out and slide into an ESD Waste2Water, Inc. Clipping Separator for disposal at a later time. The remaining wash water and fine solids then travels into an Above Ground Solid Separator where additional settling can take place. The wash water then flows into the Biological Wash Water Treatment system where the system can biologically remove or neutralize the contaminants so the grey water is safe to recycle. 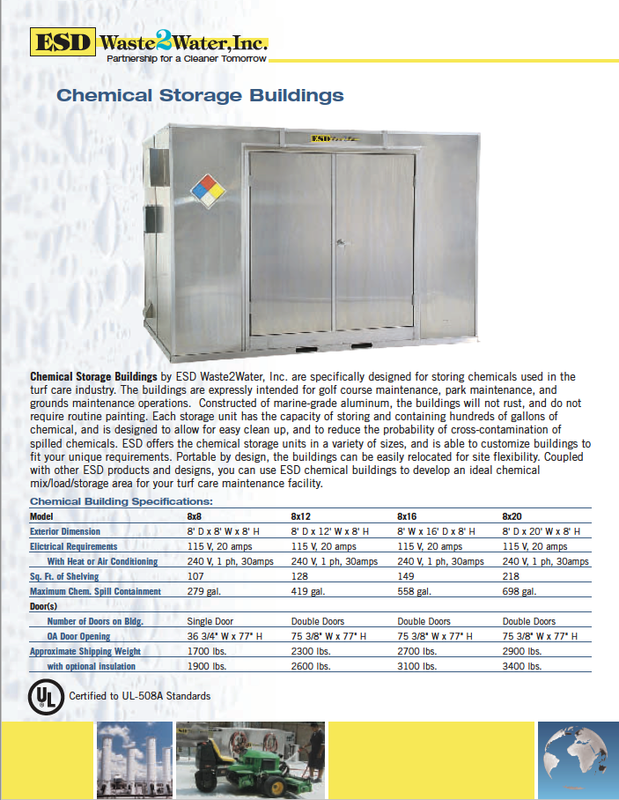 Ask a qualified ESD Waste2Water Manager to assist in designing an Environmental Center including a chemical storage building to centrally locate all of the facility contaminates into a designated area for fuel, wash rack and chemical storage mix/load.